In 2015 after an 11 year career in the advertising industry Mark (AKA the Smiling Terminator) decided to pursue his life long passion for fitness. 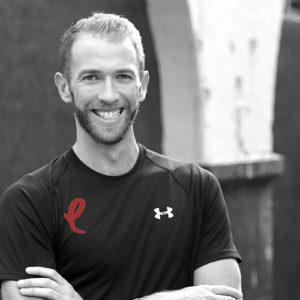 Mark has a broad sporting and athletic background and over the past 20 years has been actively involved in competitive tennis, crossfit, gymnastics strength training, mobility conditioning, strongman and Iyengar yoga. He has worked with several personal trainers to achieve his own fitness goals & expand his skill set. Mark brings this multi-disciplinary approach to his training (along with a good sense of humor & compassion). Mark gains great satisfaction from assisting his clients to realise their aspirations, and sharing his knowledge and experience to make their fitness journey more achievable, challenging & fun. He believes in walking the walk, while he’s talking the talk. He trains hard year round, testing the latest research and modern trends on himself from the health, and fitness industries. This ensures he stays on top of the latest practices and methodologies to achieve the most for his clients, when and where they need it.